The AEGEEan: Before we start talking about your successful Network Meeting (NWM) in Istanbul, can you tell us more about AEGEE-Istanbul? What are the things well-structured for AEGEE-Istanbul? AEGEE-İstanbul was founded in 1992 and signed the antenna contract at Agora Praha. We celebreated our 20th Anniversary with a beautiful ball. From the very beginning, in 1996, AEGEE-İstanbul campained for Turkeys’ inclusion in Socrates, Leonardo and Youth programs. 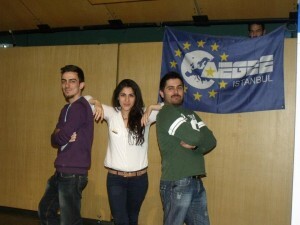 In the end AEGEE-İstanbul managed to do it all. 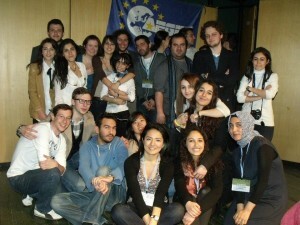 But probably the most popular AEGEE-İstanbul event was the Autumn Agora İstanbul 2010. We also had a twin antenna project with AEGEE-Beograd. And we are planning to establish a new twin antenna project with a surprise antenna! We have a nice office at İstanbul Technical University and where we are having our meetings. Almost every day we have our project and working groups (WG) meetings. Recently we organized the Spring NWM with a dedicated organisation team. Furthermore, what I can say about AEGEE-İstanbul is that every Friday we are making a presentation of AEGEE to the people who want to join us. What project and working groups do you have in your local? We have Public Relations WG, Education WG that is currently giving French courses thought by one of our member, Summer University Project Team, who work with great effort. Besides we have Yeni Nesil Yolda ( Young Generation is on the Way) Project Team. With this project we are making agreements with high schools and holding seminars that present what kind of opportunities pupils will gain when they begin university and we are presenting AEGEE, Erasmus, Youth in Action Projects, European Voluntary Service (EVS), Socrates and Leonardo in order to make them aware of Europe, of ways in which they can gain their mobility, before the university. We also have Turkey- EU discussion session in our local and at our weekly meetings we are having discussion sessions on topics that we choose during the week on purpose to keep our Active Citizenship part alive. Do you also promote the European projects or working groups of AEGEE to your members in order to make them become more active in AEGEE? During our Local Training Courses and presentations for new member, we are giving detailed information about European level of AEGEE, how they can join projects and working groups and we are also advising our members one on one depending on their personal interests. We are promoting European level events, projects that are announced, on our mailing list to make sure that our member don’t miss out on them. This year we were the partner for the Youth in Action (YiA) project organised by AEGEE-Köln. In December the ‘Europe on Track’ final conference was organised by AEGEE-İstanbul and the Visa Freedom WG also made a fruitful session gathering information about EU- Turkey relations and visa problems. And lastly there was the NWM. Can you describe to us what makes NWM-Istanbul different than the other NMWs of the Network? In the past the NWMs in our area were not that international, especially the ones organised by Turkish speaking locals. A high percentage of the participants were mostly from Turkish speaking locals. But this NWM had a lot of participants from locals from the Caucasus area and also the rest of the Network, from AEGEE-Sankt Peterburg to AEGEE-Zaragoza. This is why Spring NWM-İstanbul was different than the other NWMs in our network. Also the thematic part was very successful. Tika Kukhianidze and Beata Matuzska worked really well on that. We focused on problems of the locals and on creating permanent solutions for these problems. So, what or which project(s)/ event(s) is the next stop? Can you tell us about the future plans of AEGEE-Istanbul? During our LTC, our members came up with an idea for a new project named “PRESS the Button”. Since we are having a lack of freedom of speech in our country, this project will be a way to raise our voice. And also we want to spread it to our Network. On the other hand we are planning to establish a new twin antenna project with a surprise antenna. We will keep being partner for YiA projects for the next year. 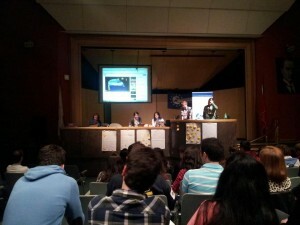 An Exchange with AEGEE-Thessaloniki and AEGEE-Köln is in progress as well. And of course we are working on our SU project with great effort. Besides talking about AEGEE-Istanbul, The AEGEEan also talked with Meltem Darakci about the success of the Turkish antennae. Firstly, can you tell us more about how you feel as a new elected Network Commissioner (NetCom), Meltem? Then, would you like to give us a hint(s) about AEGEE-Istanbuls’ success, you being board member of AEGEE-Istanbul? When I was elected it was a great joy at first and then I began to feel the responsibility of being a NetCom. Now, we, the whole new elected team, warm to our work and are getting ready for a fruitful term. It is all about our members. We, as AEGEE-İstanbul, put an emphasis on spreading volunteering ideas and AEGEE spirit to our members. 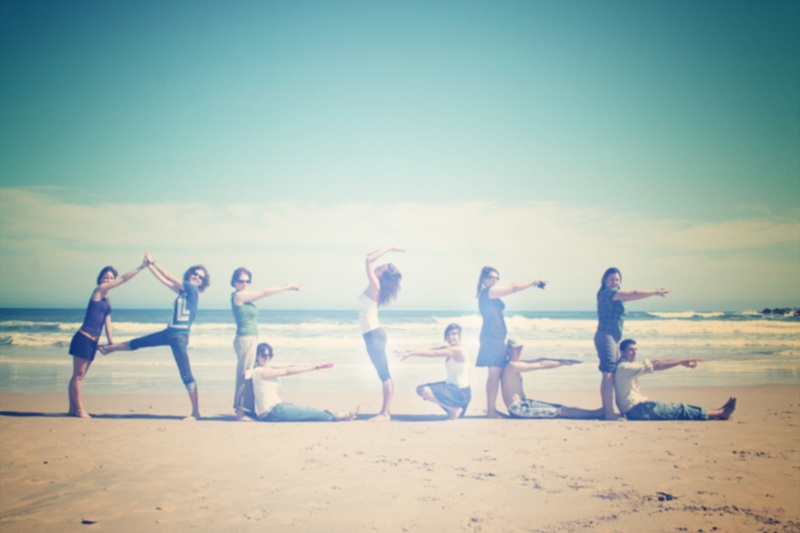 Because when you organize any kind of event or project, you need to have a dedicated team/ members. Otherwise a local can not move forward… I can say that this is our certain achievement. In 2013, Eskişehir, Ankara and now Istanbul were honoured as local of the month from the Turkish speaking and Caucasian network. Would you like to share your feelings about that success, as being their Netcommie? Our Network is implemeting indeed good thematic events, projects based on active citizenship. AEGEE-Ankara and AEGEE-Eskişehir are very good with their thematic parts. And that is the result of it. Thanks to Tikas’ and the locals’ effort at the Agora Rhein-Neckar four of our contact antennae upgraded and more will come. That also motivates me a lot to put my all effort to support locals and develop them more. Most importantly that is pushing all of us, members, locals, the Network to prepare even more successful events, projects, cooperation.